Toast to the host. 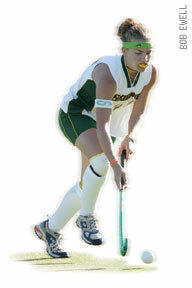 Skidmore hosted two Division III national playoff events in one week in November. The field-hockey team played a first-round game on Thoroughbred Field, and women’s soccer hosted a four-team regional at Wachenheim Field. Both events drew fans to the bleachers and also to computer screens, where game stats were posted live. Soccer. The women made it to Division III nationals (their first time since 1996), battling Western Connecticut to a 0-0 tie that was lost by penalty kicks. In their 13-4-5 season, the T’breds allowed only eight goals and had 16 shutouts. One of their two 0-0 ties with William Smith was lost by penalty kicks in the Liberty League championship finals. The men just missed the Liberty tournament, with a 10-6-2 record. Field hockey. Skidmore edged St. Lawrence, 1-0, to become Liberty League champ and compete in D-III nationals, where it fell in the the first round to Eastern University, 3-2. The 15-4 season was led by All-America Christine Kemp ’11 (at right), with 18 goals and 14 assists. Volleyball. Erica Duncan ’09 earned All-America honors. Golf. Skidmore won five of six fall tournaments (the Liberty League by 17 strokes!) and begins the spring ranked third nationally. Tennis. The women start the spring ranked 24th nationally; three players won their singles flights at this fall’s state championships. The men won the fall Rochester Flower City Championship and aim for a return trip to nationals this spring. Crew. Skidmore took a first in the Open Women’s 8 at the Head of the Fish Regatta. The boat hopes for regional and national honors in the spring.